A distinct voice, strong lyrics with largely acoustic music that marries jazz, world folk and pop. 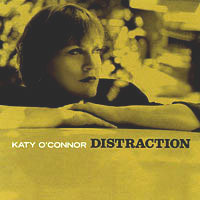 After years of interpreting jazz classics and American pop standards, singer/songwriter Katy O'Connor has released her CD "Distraction", a collection of 12 original songs. Lyrically, Katy explores distracting situations, ranging from the title tracks playful look at the art of procrastination, to the emotional account of letting go with a hopeful heart in "Time Will Tell", to the absurdities encountered on a rush hour subway in "Daily Rat Race". This largely acoustic recording marries jazz, world folk, and pop using instrumentation including Brazilian percussion, cello and tuned Bass Ale bottles. The result is a rich, moody, thought-provoking album. Bobby Rivers, Today In New York, WNBC-TV heralded Katy as a "New York Best bet" while New York's Backstage critic, Roy Sanders wrote "Two things are especially striking about singer Katy O'Connor, the first her voice, a very expressive instrument... the second her approach, she can penetrate the soul of a song." You have to have this wonderful album. loved the whole cd, cant wait to hear your next one.